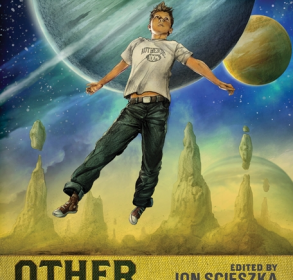 Other Worlds, the fourth volume in Jon Scieszka’s Guys Read anthology series for middle school boys, features ten thrilling tales of science fiction and fantasy. Each story is by a different author. Some of the authors are well known, such as, Rick Riordan, D.J. MacHale, and Ray Bradbury. Though Guys Read is based on what boys want to read, it also can be interesting to girls who like to read science fiction and fantasy. Most of the stories are adventurous, intriguing, scary, and other-worldly. One of the 10 stories I really liked was called The Klacked Bros. Museum. It’s about a father and his son, Luke, who go on a trip, but when the train before them derails, they have to get off the train and wait for about five hours. During the wait, Luke’s father decides to go to the museum near by. In the museum they find a ghost boy who follows wherever his ashes go. The ghost boy is very fond of Luke, but when Luke’s father does something bad with the ashes, things change. Overall, Other Worlds was an interesting book. Though I loved all of the stories, I didn’t really enjoy the last one. It was very confusing and wasn’t very intriguing. I recommend these books to 6th and 7th grade boys and girls who like science fiction and fantasy. Although people don’t like short stories, I liked how the editor, Jon Scieszka’s, had 10 different stories. It is very different than what books are normally like.